Miles of undersea cables link the Pacific Rim to One Wilshire. It is estimated that one-third of Internet traffic from the U.S. to Asia passes through the building. 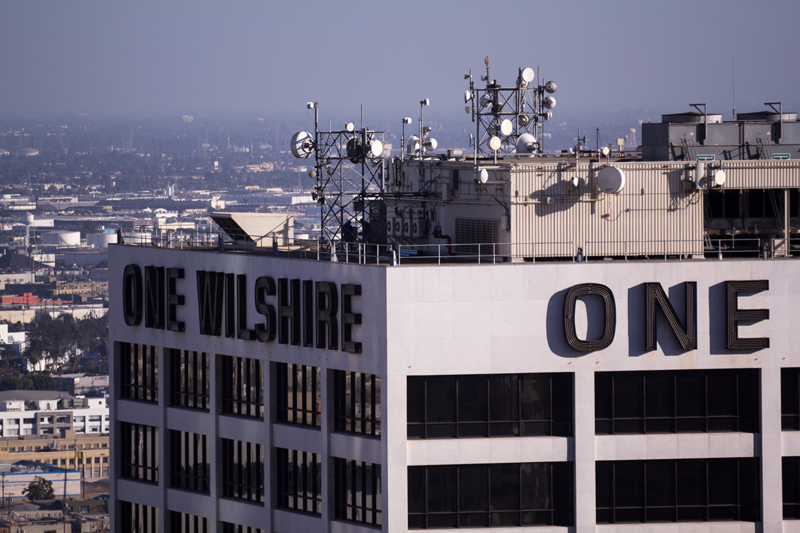 For this reason scores of service providers, online content distributors, and carriers call One Wilshire home. Verizon, AT&T, Amazon Web Services and Netflix have all set up shop in the structure. Henson’s character isn’t a person or an avatar actually. 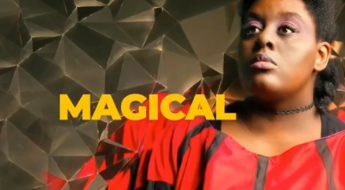 She’s an entertainment and trending algorithm that runs BuzzTube a trending website that makes it’s vloggers money. YESSS helps Ralph and Vanellope navigate the web and become trending stars. YESSS’s avatar changes hairstyles and outfits constantly to create and reflect trends. See her coat? That’s not fur, it’s actually made up of individual fiber optic wires that are constantly combing the web. Cute right? Contrary to that tweet picturing the all-male group of Disney creators celebrating the completion of Ralph Breaks the Internet. 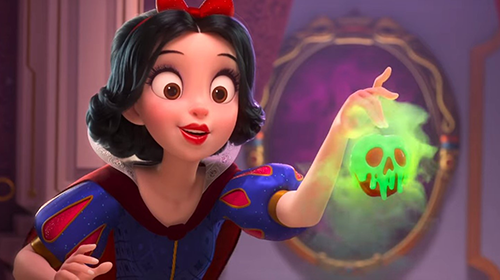 I was in a room with the all-female heads of the teams that created the Princess scene and in fact, co-writer Pamela Ribon leant her voice to Snow White for rough cuts and she was so good, the director decided to keep her on as the voice of the iconic character. She had the idea for the iconic scene and executed it so well, that limited changes were made to her original concept. “I really thought it would be fun to do a scene of Disney poking fun at itself.” Ribon says I also got to meet Ami Thompson (Art Director, Characters ) and KiraKira Lehtomaki (Head of Animation) (Head of Animation) who also cae up with the casual outfits and looks. In that same scene, Vanellope teaches the PRincesses how to relax, which transitions to a scene where they are all laying around in modern casual PJs with their hair down and in Tshirts! Eachshirt actually is a graphic tee in reference to the character wearing it. For instance, Merida’s shirt says “Mum” under the image of a bear, in reference to how she accidentally turned her mom into a bear. And a narcoleptic Sleeping Beauty’s shirt conveniently says “Nap Time”. (I just want to get my hands on Mulan’s baseball jacket). 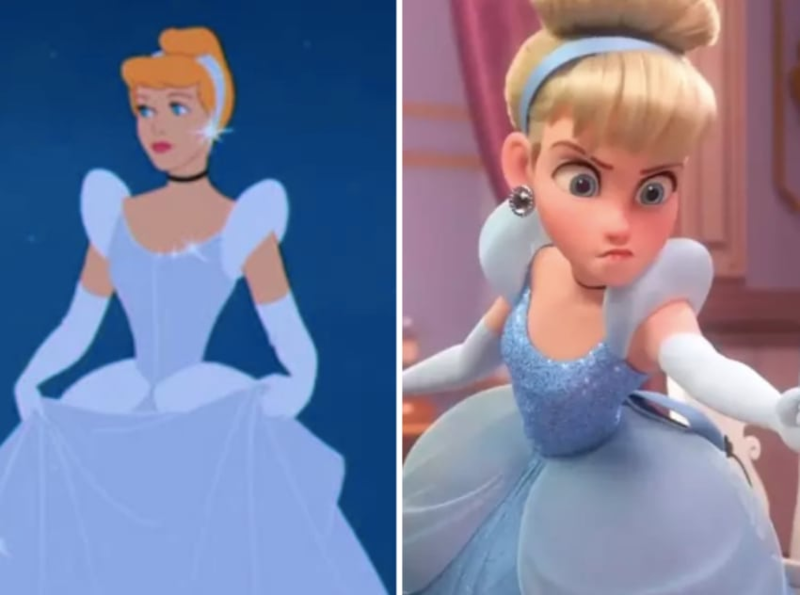 People have commented on how the Disney Princesses look different in this film, and they’re not wrong, but…it kinda had to be done. Little Mermaid, and the Princess and the Frog for instance, were created with traditional 2D cell animation. In order for her to work in a scene with, let’s say Moana, which was a 3D animated movie that debuted in 2016, Ariel had to be updated. Creative teams took special steps to update each character. They had to find a balance between keeping the character’s design and motions similiar to the originals, but also blending them into the 3D world of Vanellope and Ralph seamlessly. One of those updates was giving Cinderella actual ears. Apparently, the appendages were not a part of her original design in 1950. Wonder Woman’s Gal Gadot, voices the character Shank, who is the main character in an online racing game called Slaughter Race. Which does exactly what it says on the tin. The first time I saw her character, I thought she was going to be a baddie in the movie. But it turns out that, like Calhoun (Jane Lynch), she tough as nails, but does have a soft spot for Vanellope through their shared love of racing. 8. There are a ridiculous amount of animated characters in this movie. In most animated movies, the foreground characters get all of the animation, lighting rigging and attention. But in this movie, the backdrop of most of the story takes place inside the internet, which is literally building on top of itself all the time. (Just like new websites launch every second). And there isn’t a single frame where a Netizen, Net User or screen isn’t moving along streets that run above below and through each scene. For context, BOLT had 57 characters total, Wreck It Ralph had 421 character variants (different looks, clothing, skin tones for each character) But according to Dave Kaye, Head of Characters and Technical Animation, Ralph Breaks the Internet has 434 unique characters and a whopping 6,752 variants. Which means outside of the the main characters, you should not see a single duplicated character. 9. 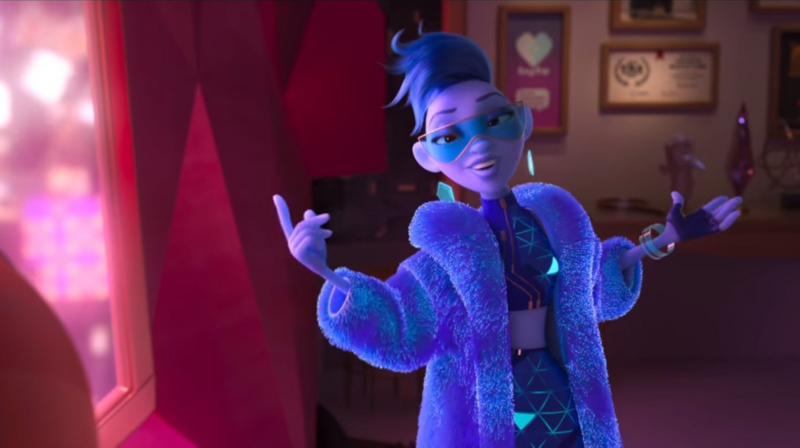 Daft Punk, Imagine Dragons and yes, Rick Astley Are on the Ralph Breaks the Internet Soundtrack. No you’re not getting Rickrolled. That really is Rick Astley’s “Never Gonna Give You Up on the new soundtrack. Along with some new beats from Daft Punk and a new song called “Zero” from Imagine dragons. Check out their meme-filled video above. 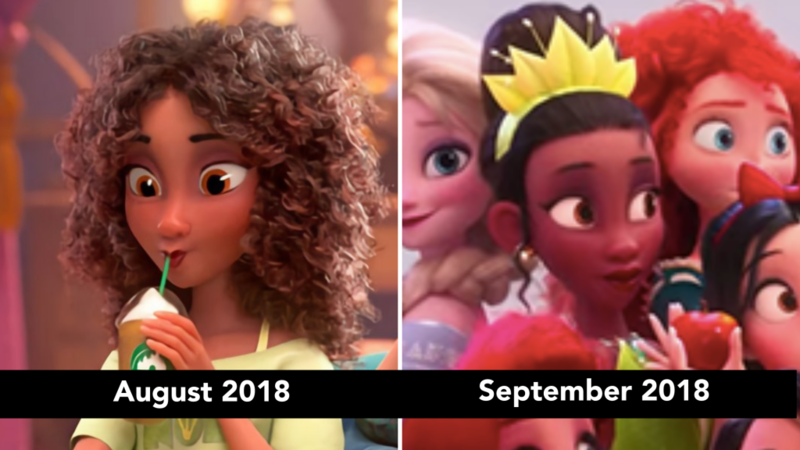 On the left is Tiana’s look when the trailers first dropped and this week, her new skin tone and features. Remember the first look that was dropped of Tiana and how light her skin was and how European her features were compared to the original animation? Admittedly, there are definitely some light and shading differences a you move from 2D and 3D, but social media blew up with complaints. In addition, her hair somehow went from a silk press up in a bun that was black, to a weird, damp light brown unfinished twist-out in the Princess casual scene. Well, I think Disney heard the complaints, because in the trailer that dropped yesterday as well as other new promotional material, Tiana, definitely has dark pretty skin. In fact, if you look closely, Pocohantas and Mulan’s skin tones look better too. 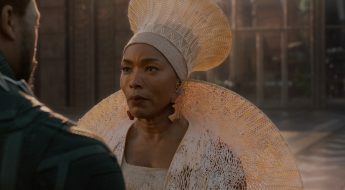 (But Disney, we need to have a long talk about how black women take care of their hair at night). 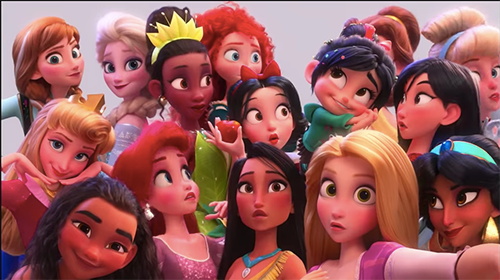 In this image from the new trailer that dropped 9/20, you can clearly see that Tiana, Pocohontas, Moana and Jasmine’s skin tones have been adjusted to look more like their original animated renders. 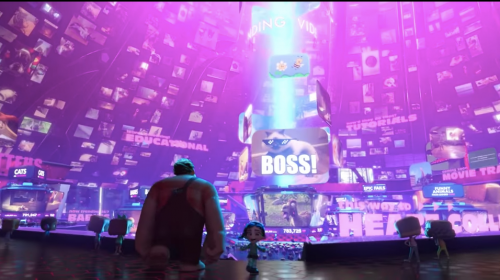 Ralph Breaks the Internet is in theaters November 21. What do you think of Tiana’s revised look?